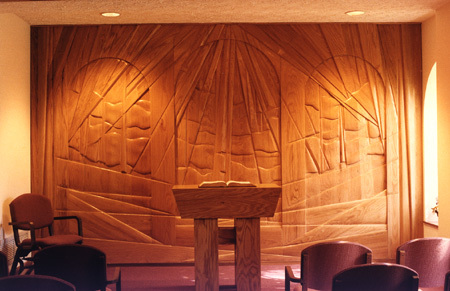 ANDRÉN & KNAPP - INTERIOR, "Hospital Chapel"
We carved this wall in oak wood. It is 15 feet long and 8 1/2 feet tall. It represents healing and is entitled, "The Light Breaking Through The Clouds". It is in a nondenominational chapel that is used regularly by Jews, Muslims, Christians and Hindus, sometimes all at the same time. This chapel must be comfortable for all the different groups that use it. The table is used by the Priest as an altar and by the Rabbi as a reading table.